NASA's Private Astronaut Space Taxi: Who Could it Be? NASA's Commercial Crew Program is designed to get American astronauts flying from U.S. soil to the space station by 2017 via contracts with commercial companies. Who will be responsible for flying Americans to the International Space Station by 2017? Today, NASA could announce which private spaceflight company (or companies) have been selected to move toward developing an astronaut taxi service to the orbiting outpost in the next three years. Space agency officials are choosing among four different spaceflight companies — SpaceX, Boeing, Sierra Nevada and Blue Origin — as part of the Commercial Crew Program. Each company in the running has developed its own technology that could deliver humans to orbit someday. The program is set up so that NASA will buy rides for their astronauts to the space station on private spacecraft that launch from the United States. 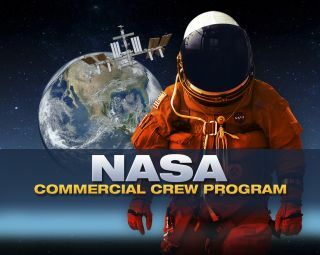 While many people think that NASA will announce the selection of one company during the commercial crew news conference airing live at 4 p.m. EDT (2000 GMT) today (Sept. 16), others have speculated that the new award could be split among multiple firms. SpaceX founder and billionaire entrepreneur Elon Musk unveiled the company's Dragon V2 manned spacecraft during a dramatic reveal in May. The roomy capsule is designed to fit up to seven astronauts on flights to and from space. If chosen for the contract, the Dragon V2 is expected to launch atop the company's Falcon 9 rocket to the space station. Upon its return to Earth, SpaceX's capsule should land vertically using rockets on the base of the craft, and it will be reusable. Boeing's Commercial Space Transportation 100 vehicle (CST-100 for short) is designed to fly seven people into space. The capsule has just gone through a rigorous design review, and engineers with the company are already creating test articles that will be used to test the capsule's design. The CST-100 is expected to launch to the space station atop a United Launch Alliance Atlas 5 rocket. CST-100's interior will also be unique, featuring blue lighting in the cabin. Dream Chaser — Sierra Nevada's entry in the Commercial Crew Program — looks more like NASA's space shuttle than any of the other spacecraft in the running. Dream Chaser is designed to launch atop an Atlas 5 rocket to space, but once it returns to Earth, the spaceship will fly down to the ground, landing on a runway. Sierra Nevada, Boeing and SpaceX all split a $1.1 billion award in 2012 to fund their projects. Amazon founder Jeff Bezos' secretive spaceflight company Blue Origin is also in the running for the contract. While Blue Origin did not receive funding in 2012 like SpaceX, Sierra Nevada and Boeing, the spaceflight company did get $22 million from NASA in 2011. Bezos' company is developing a conical spaceship called Space Vehicle and has tested a new rocket engine.